Stocks posted solid gains for a third straight day on Wednesday, helped by some decent economic numbers. The Dow Jones industrial average (^DJI) gained 162 points, the Standard & Poor's 500 index (^GPSC) rose 19, and the Nasdaq composite (^IXIC) added 52 points. 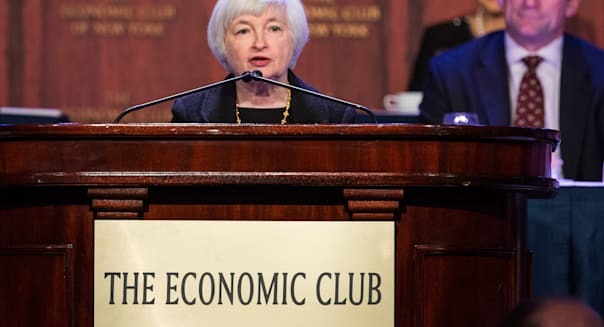 Andrew Burton/Getty ImagesFed Chair Janet Yellen spoke at The Economic Club of New York on Wednesday, and markets liked what they heard. The Dow was led by its old-line companies after the Fed reported a stronger-than-expected increase in industrial production in March, and Fed Chief Janet Yellen made dovish comments during a speech in New York. Boeing (BA), Exxon (XOM), Chevron (CVX), United Technologies (UTX) and 3M (MMM) all gained more than 1 percent. Financial stocks were also strong performers. Visa (V) gained 2 percent; Goldman Sachs (GS) and American Express (AXP) rose more than 1 percent. But the blue chip loser of the day award goes to United Healthcare (UNH). It fell 1.5 percent after Citigroup cut its rating on the stock to "neutral" from "buy." Airlines found some clear skies after a bumpy ride over the past month. American (AAL), United (UAL) and Delta (DAL) all gained about 5 percent. The other big story was earnings. Yahoo (YHOO) jumped 6 percent. Its results were okay, but the focus was on soaring sales and profit at the Chinese e-commerce giant Alibaba. Yahoo owns a 24 percent stake in it, and stands to make a big profit when Alibaba goes public later this year. PNC (PNC), a major regional bank, gained nearly 3 percent after topping expectations. But industry giant Bank of America (BAC), which sponsors this report, fell 1.5 percent. It posted a loss due to huge charge related to legal settlements. Also, CSX (CSX) fell nearly 2 percent. Its net fell, hurt by weather-related disruptions to its rail operations. Among the major Internet stocks, Google (GOOG) rose 4 percent and Amazon (AMZN) added 2.5, but Twitter (TWTR) fell 2.5 percent. And biotechs were generally higher. Regeneron (RGEN) gained 4 percent on some positive brokerage comments about its cholesterol-fighting drug that's expected to hit the market later this year. But Intercept Pharmaceuticals (ICPT) lost another 4.5 percent Wednesday. This week alone, it's down 21 percent. Finally, Sodastream (SODA) jumped 8 percent on reports that it's in talks to sell a big stake to an unidentified strategic partner, possible PepsiCo (PEP). Earlier this year, rival Keurig Green Mountain (GMCR) linked up with Coca-Cola (KO). At 10 a.m., the Federal Reserve Bank of Philadelphia releases its monthly survey of regional manufacturing conditions, and Freddie Mac reports weekly mortgage rates.